Anyone found good settings to use BO4? I been having great games with ping assist on the r1 with the old firmware. I also have a xr500 but im using it for wifi since im not getting good results with the geo filter with bo4. Ping assist its whats getting me a 17ping in the game. 70/70 is recommended and what most use but it could vary slightly for every person. For me it's 70/65. Everyone's line quality is gonna be a bit different so don't necessarily pay attention when someone drops it low to 6 up 3 down or such. I'd give it a few days before trying anything big though. A majority of players are feeling the connection blues right now but it's not necessarily your line quality or even settings. Treyarch screwed the pooch with connections somewhere in their last update. Of course you want your line the best possible but not much can really be done till they unbugger what they did. Personally i recommend just sticking with 70/70 and using ping assist or your geo to find the closest servers and then tinker more after Treyarc corrects their issue. there is no ping assist on duma os. My line is stable right around 30-40ms ping no spikes. Wondering if I should switch back to r1 software so I can use ping assist. From what Ive been reading r1 is been better. Thanks for your input! Sorry i just assumed you were on the original set up. I don't have ping assist either. Also on Duma OS. The geo should be enough i would think as both services are just meant to get you the closest server with the lowest ping. And we've been collecting a pile of address for Fraser to add into the cloud to get the geo up to date. The next cloud update and the introduction of Ping Assist on the R1 (DumaOS) will make all the difference. I'd recommend holding out until then! This is just for the R1 version though and not the XR500? If so, any idea on when the 500 could get the update? Suppose you can't say when? Hopefully real soon!! Up to NETGEAR - but they'll be keen for it to be out soon too. Can't say when! But agreed, hopefully real soon! This is good to know because it is playing terrible right now. I am getting one shot killed by everything. I don't feel, notice, experience any bullets. I just die. It was so good before. Now it's garbage. I've had no such luck. Game ran great until the last two days. I can barely find matches. When I do they are lagfests. I am dying with one shot registering on my end. Just curious why moving from MN to Missouri might help? Cause all of the servers that are close to me in the midwest are there. I.E. illinios, missouri and sometimes good atl. I have pinged all of these prior and all except illinios from time I get good games. When I was playing ww2 I found this out. Missouri server for me plays the best. how do you really play with the buffer bloat sliders on the xr500 an see how they effect your game play? like on ping plotter or something or just in games? You don't necessarily need higher speeds for a more stable line - that's a myth. You should definitely be running your own tests using Pingplotter. If you need help understanding the results feel free to share them here. Improving your line quality is a matter of replacing Ethernet cables, finding the best modem, and sometimes getting your ISP to take action. Quick question for you or anyone else on the Netduma team that may see this first. 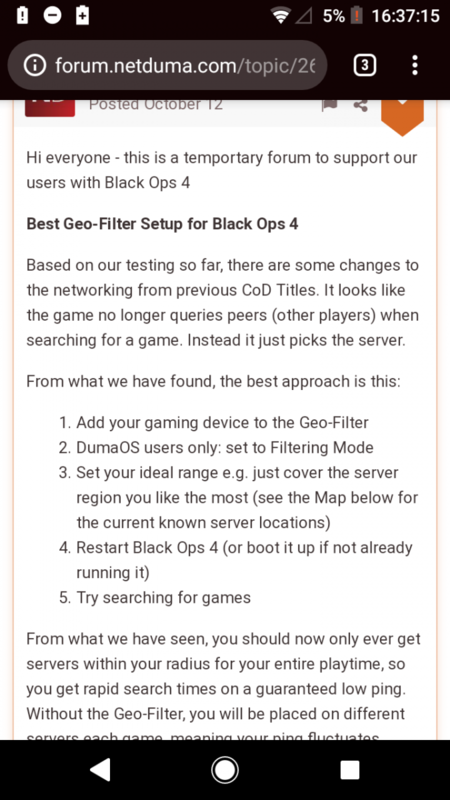 By "no longer queries peers", does that mean BO4 no longer uses prelobby hosts before transferring to a server? In other words if you put your home marker in the ocean, set the ping assist to match the latency you get to your local server and search for a game, you won't struggle to find a game because of a prelobby host that you ping with a higher amount of latency than you get to the server so you'll connect straight to said server? I believe you're right. 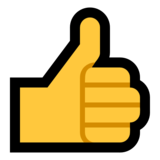 We're having some amazing results with Ping Assist on Black Ops 4 - there's a few issues to work through before it becomes available though. We'll keep you posted on that. That seems odd though. Ping assist worked in games with servers by allowing prelobby hosts before connecting to the server (hence not being able to find a game if you just set the ping assist value to what you get to your nearest server). If you just ping servers on the filter map now, isn't ping assist made redundant for 99% of players since we mostly connect to servers anyway? I don't think so - the old Ping Assist shouldn't be used as reference in this case since the developers have kinda' overhauled it. I haven't personally tested it otherwise I'd give you a more informed answer, but I've heard great things from the developers / testers about it. Fingers crossed that the new cloud update and that will help as much as we're hoping! I mean, before we know it few months pass, and the game is old already, the time is now, and even longer for xr500 users, had I known the netduma was not going to fully handle that router, would of have never bought it. Well the game itself is borked at the minute. There's a lot of testing and time being put into BO4 on our end to get to the bottom of it - hopefully the results are worth it.